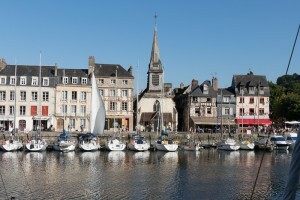 Honfleur. An absolutely lovely little town. Pretty Medieval houses. Well worth a stop and a tea break. See first two photos. 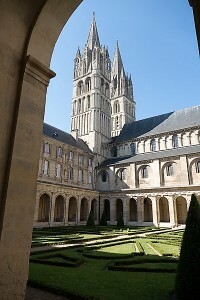 Caen. The Medieval part of this city was almost entirely destroyed during World War II, but I still very much liked it, its liveliness, lots of cafés and good eateries. Stefano, however, had eaten something he shouldn’t have (!) 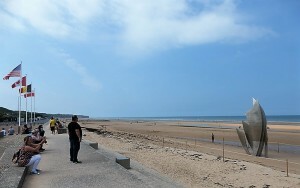 back in the city of Le Havre and spent more than 24 hours in our hotel bed, quite sick, poor dear. Food poisoning. Ugh. 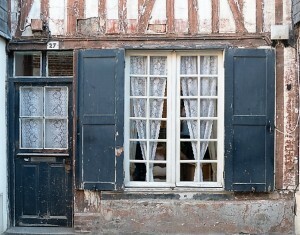 So he missed our walk around Caen. My photo no. 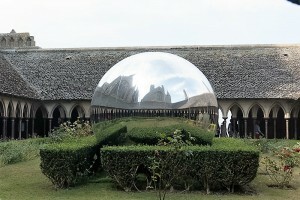 3 depicts the Abbaye aux Hommes. Take the guided visit…it was fantastic. 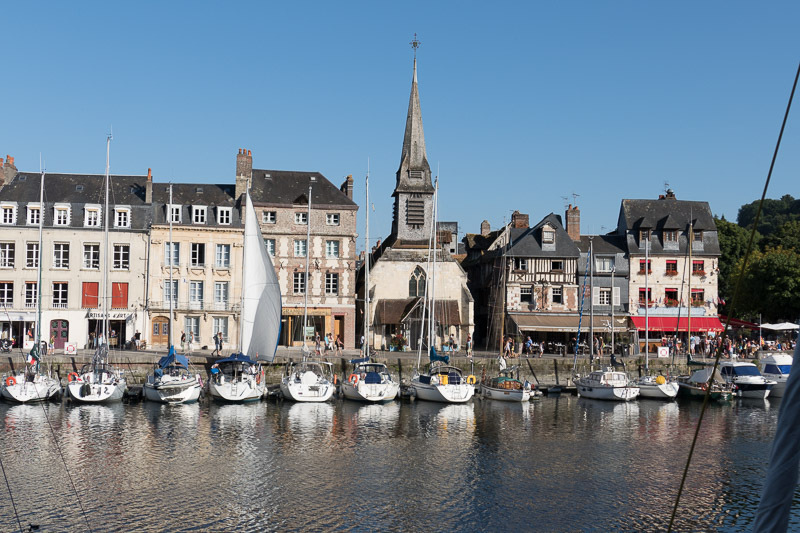 Bayeux. Its main claim to fame, deservedly so, is its amazing Tapestry, measuring 70 meters long and illustrating the events that led to the Norman conquest of England in 1066. 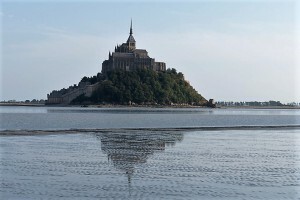 It has survived, incredibly, more than nine centuries. How about that??? Highly recommended. By the way, definitely get the audio guide! The following two days are a bit of a muddle, since I slept, mostly, in the car and then in the hotels where we stayed. And then, bam!, I was fine again. Stefano and I had even considered returning to Italy with our friends (who had to leave), but we decided to prolong our stay for another week…after all, the time we’d both been sick added up to almost a week…We wanted that week back! By then we were in Rennes, Brittany. After saying goodbye to our friends, Stefano and I took a day trip to Carnac to have a look at the thousands of standing stones dating to the Neolithic. Very interesting, but, I have to admit, I am still madly in love with Avebury, near Salisbury, in southwest England. And that is that. 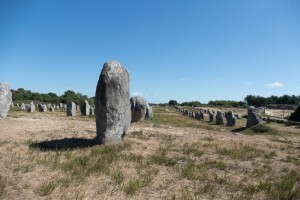 Still, Carnac has its own charm, too. And it is near the first site that we had the BEST crepes of our entire trip, so let me know if you are traveling in that area, and I’ll give you the name of the place…yummy! In fact, that reminds me of a nice little story: after we had finished our crepes in this small, ancient farmhouse, our waitress asked us if we wanted anything else, but we were too stuffed so we declined. I proceeded to tell her, though, in my rusty French, that those were the best crepes we’d had in France. She looked amazingly pleased and thanked me over and over again…and then I overheard her telling the cooks in the kitchen. But it didn’t end there. A short while later the head cook came out and THANKED me for my kind words. I was quite overwhelmed, overwhelmed in a good sense, of course. It really takes so little, a few words, a small gesture, to put a smile on someone’s face. After Rennes, which is nothing to write home about (we stayed in a lovely little inexpensive hotel, though), we stayed in Saint-Malo for three nights. As it happened, our hotel was located outside the town walls…about a 20-25 minute walk from the town. 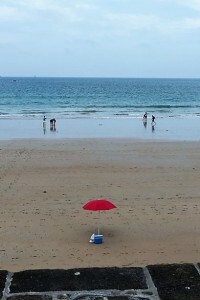 Lucky us, since we didn’t care for the Saint-Malo at all…too touristy and crowded for us. 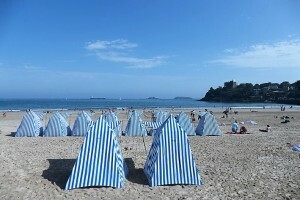 That said, we had a nice rest there (with day trips to Dinard and Dinan, both very cute and worth a visit, especially Dinan. 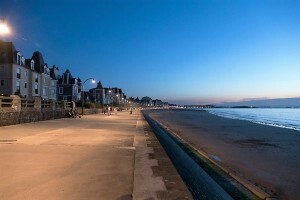 But the promenade (see photo on the right, below) along the beach in Saint-Malo is indeed quite something. I remember walking back to our hotel after dinner one evening and hearing someone belting out a familiar Italian tune (not “O sole mio” but something similar). 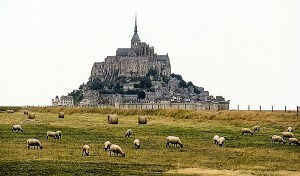 Mont-Saint-Michel. Talk about crowds, mamma mia! But we stayed there one night, and the hotel staff had given us an upgrade, so our room was on the third floor with a great view of the bay. The guide instructed us to take off our shoes and sandals. But we hadn’t heard his presentation (in French), since we were the last to join the group, so we looked at each other and said, in Italian, “no way we’re taking off our shoes. There is horse doo doo in the square outside the main town gate.” 😉 And so we were the only ones to keep our shoes on. But as soon as we got outside and began walking off to the left, we realized why the guide had said that: the dry caked mud began getting wetter and slippier. So off came our sandals, which we attached to our knapsacks. The trek outside the city walls ended up lasting more than THREE hours. Three hours of walk walk walk WALK in slippery mud and sometimes in water up to mid-thigh. We saw people doing the crossing on their own, but that would not be my choice at all. The guide at one point gave us the experience of getting sucked in by quicksand, and it was not nice at all. So be safe! The tour is really worth it, in spite of the slightly negative aspects (the slippery mud, mainly…almost lost my footing a couple of times…that would have totaled my camera, for sure!). We were able to take photos of Mont-Saint-Michel from a completely different perspective compared to the regular tourist who might spend just a few hours inside the town. 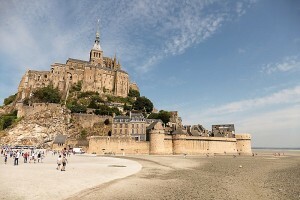 Not to speak of the spectacular views we had (see the first photo of Saint-Michel, above). But I do have a few comments, as always. Ah yes, rapamycin is being studied in myeloma treatment, too…A number of clinical trials testing rapamycin, and its analogs, such as temsirolimus, on MM patients are going on right now, in fact. It’s a strong immune suppressor, and it’s also a mTOR inhibitor (like quercetin, I would like to add). I mentioned rapamycin years ago in my quercetin post, which you can find by using the blog’s Search box on the upper right. In fact, if you type mTOR into the above-mentioned Search box, you will also come upon my mTOR-rhubarb post. Hey, I’d forgotten about rhubarb…!!! At this point you might be wondering what mTOR is. Well, quoting from my 2007 quercetin post, it’s “a really nasty pathway involved with myeloma disease progression. When mTOR is activated, you see, MM cell lines resist being killed.” Bad, bad, bad. That is the question posed by a program called “Trust me, I’m a doctor,” which was recently broadcast on BBC2, a channel that I cannot get here in Italy, unfortunately. I heard about it from some friends in the UK, and then I got to work and found a bunch of articles about the program, one of which I will share with you today. They split the 100 volunteers into three groups–one group took a placebo, another a teaspoon of turmeric powder (mixed in with their food), and the third one took the same amount of TURMERIC in the form of a supplement. My first note: it appears that the third group didn’t take CURCUMIN, but turmeric, the spice. We’ll get back to that later on. Blood samples were taken at the beginning of the experiment, then after six weeks. As far as the immune system was concerned, there were no significant changes. But the results from the DNA methylation test were compleeeeetely different. Methylation, in a nutshell, is a process that can stop genes from working. That can be a bad thing…or a good thing. An example of “bad” is that methylation is can be a BIG trigger for the development of cancer. I like the way Michael Mosley describes methylation, as “a dimmer switch that can turn the activity of the gene up and down.” Images can really help us understand complicated processes, methinks. Anyway, as far as this experiment is concerned, all we need to know is that, as I said before, methylation can trigger the development of cancer. “This is a really striking finding,” said the professor in charge of the experiment. One gene was affected, in particular…the SLC6A15 gene, which is associated with 1. depression and anxiety, 2. asthma and eczema, and…3. CANCER. Now, as I mentioned above, my only problem with the experiment is that they apparently tested turmeric, not curcumin, supplements. Had they used a curcumin supplement, I have a feeling that the results would have been different. That said, the fact that the turmeric powder users cooked with the spice and had this amazing result in such a short period of time confirms what we already knew: that turmeric (and therefore, curcumin) becomes more bioavailable when taken with heat and/or fat. Another important result of this experiment: for perhaps the first time ever, scientists have shown that a change in diet can have an important effect on gene methylation and, consequently, on our risk of developing cancer. Amazing, eh?